EPDM is a lightweight, synthetic rubber made from Ethylene Propylene Diene Monomer (EPDM). It is a versatile membrane that has been used for roofing since the early 1970’s and offers a variety of installation options. 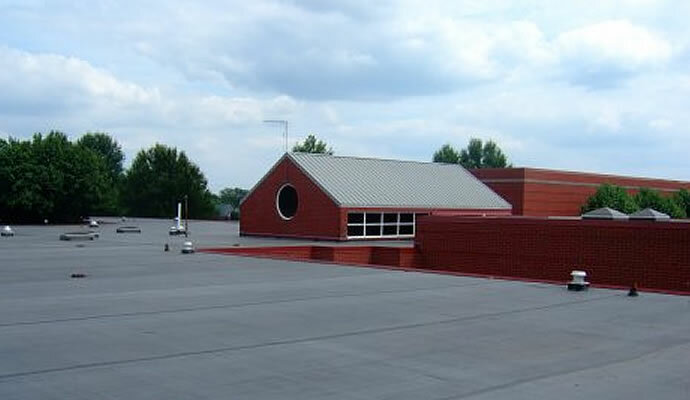 There are a number of characteristics that contribute to its prevalence in commercial roofing applications. EPDM has a high resistance to weathering and abrasion, proven hail resistance, flexibility in low temperatures, thermal shock durability, ultraviolet radiation resistance, and energy-efficiency. of leaks. Also, black EPDM roofs are not considered “green” roofs and therefore do not offer heat reflectivity or emissivity and do not qualify for potential energy savings and rebates. Depending on the thickness of the EPDM membrane, insulation layers, deck type, and installation method, EPDM warranties range from 10 years to 30 years; Call us for Warranty details.